Laura, Emily, Hilary (V), Tyler (D) and Hilary (M-B, myself) made five at the eighth meeting of the Macrobiotic Cooking Club. Laura four-wheel-drove us through the frozen outdoors to get sake and ingredients. Steaming noodle bowls and sweet roasted squash added another sixty or so degrees to the one outside. We drank Corn Silk tea and Odell’s Isolation Ale while chopping the Buttercup and bringing seaweed to boiling. After adding a splash of sake to the noodle broth, we let the bottle bubble in the noodle-water pot to heat. Mochi is a Japanese snack food made from sweet rice. Grainaissance, the same company that makes sometimes-available commercial amasake, also makes widely available commercial mochi. Commercial mochi is a ‘slice and bake’ pounded sweet rice snack that is packaged as flat rectangular cakes. The cakes are hard until you cut them into small squares with a sturdy knife and bake them in a hot (450 degree) oven. Mochi puff in the oven, becoming light and chewy. Japanese Dashi is made by bringing water to boiling with a piece of kelp submerged, then adding shaved dried bonito fish, briefly, before straining it all. The resulting stock is light and used in everything from vinegar dressings for salads to clear, hot still-life soups. The Japanese often use granulated instant dashi now, but traditional homemade dashi will lend authentic Japanese flavor even to American-made noodle bowls. We combined two styles of Japanese dashi for a vegetarian noodle broth. First, we made Kombu Dashi by placing a few squares of kombu in cold water and bringing it to boiling. Then, we removed the kelp and transformed the liquid into Shiitake Dashi with dried shiitake mushrooms. These measurements are approximate. The soy sauce, rice syrup, sake and salt must be adjusted to taste. You will know when the seasonings are balanced by tasting a distinct Japanese flavor. The kudzu is optional. It thickens the broth. Place the kelp and cold water in a pot over medium heat and bring just to boiling. Remove the kelp and add the shiitake mushrooms. We let the mushrooms simmer for 10-15 minutes to infuse their flavor into the broth. Strain the mushrooms out, reserving them and returning the pot to heat. Add the tamari, rice syrup, sake and salt, adjusting to taste once they are all in. When the broth is seasoned, add the dissolved kudzu and stir, simmering, until the broth thickens. You must have heard somewhere about the Japanese custom of slurping noodles hot. They slurp to eat noodles steaming hot without burning their mouths. In order to serve hot noodles, keep the broth simmering while you boil the noodles; and have all of the other components ready. We topped the soba noodles with shiitake mushrooms cooked in oil, then added the hot dashi and a garnish of sliced green onions. You must be cunning for the task of cutting round vegetables, such as onions, winter squash and cabbage. If their size and solidity aren’t deterrents enough, you will cuss the challenge of making uniform pieces from the shape of a globe. For winter squash, thick wedges are satisfying. However, because of their layers, onions and cabbages are easier to cut uniformly if you slice them thin as you can. The seventh meeting of the Macrobiotics Cooking Club, and seven of us cooked and ate. Kim and Barry, Emily, Laura, Tyler, Ryan and Hilary (myself). As always, bring back friends next week! It is easy to compose a balanced menu from whole, seasonal, “honest” ingredients. At each meeting we have used a variety of whole grains, garden vegetables, natural oils and sweeteners, seeds, fruits and beans. We vaguely ration recipe responsibility to avoid four pots of rice; and new members tend to like bringing sweet vegetables, like winter squash or carrots. The menu this week was yet another Winning Combination, with just enough for us all to eat our fill. We accompanied all that with Peppermint Herb Tea and Barefoot Merlot. If you don't grind Meat, you can grind Grains to look like Tuna! A few weeks ago, we made a cracked wheat and sesame dough; spread it thin and baked it into crispy crackers. This week, I tried a similar technique to make chewy sprouted grain flatbread. The ground sprouts naturally form a sticky dough. To make the flatbread, spread the dough out on a baking sheet and dry it in a low oven (200 degrees F). For a sour taste, ferment the dough with a sourdough starter (a few Tablespoons) for a day or two before spreading and drying it. Salt the dough to taste. Sprinkle sesame or another type of seeds over the dough before drying if you like. Half-way through drying, score the sheet of flatbread into small rectangles and flip it over to dry the bottom. Mine turned out really sour; we doused it in sweet Miso-Tahini sauce and topped it with pickled Daikon greens. Pressing tofu improves the texture, making it more firm; as some might say, ‘toothsome.’ It also removes moisture from the tofu, enabling it to absorb other flavorful seasoning liquids. To press tofu, spread out a clean kitchen towel or paper towels on a baking sheet or plate. Lay out the tofu in even slices and cover with another clean towel. Place another sheet pan or plate on top and put some heavy jars or books on top of that. Remember you don’t want to crush the tofu, just press the liquid gently out of it. Leave it for 30 minutes or so. To broil tofu, heat the oven broiler up. Lay the tofu slices out on a baking tray and sprinkle some soy sauce over them to season. Place under the hot broiler until they begin to brown around the corners. Remove from the broiler and flip the slices over, then return them to broil the other side. Serve them hot or in a sandwich! Lettuce grows much slower in the winter so we made this salad with whole wheat, squash and two kinds of mushrooms. Vary the grain and vegetables with the seasons. She cooked the wheat ahead of time, then cooked the diced squash and mushrooms with the shallot in some oil before mixing it all together. There were a few sprigs of parsley left in the garden for garnish, and we seasoned our individual portions with Sherry Vinegar to taste. Sometimes vegetarians like something to cut into, too. Small vegetables make good Fork and Knife food. Mother (Kim) cut each Baby Bok Choy in half and cooked them first in olive oil, then in soy sauce to season and soften them for cutting on the plate. Vegetables cooked like this are pretty enough without a garnish, but then, toasted sesame seeds are good on everything. 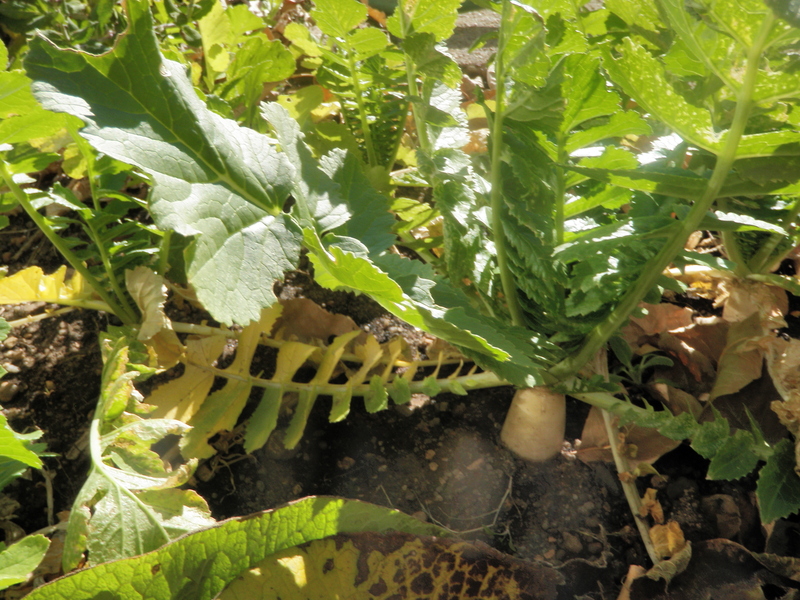 Daikon Radishes, doing their job a month ago. 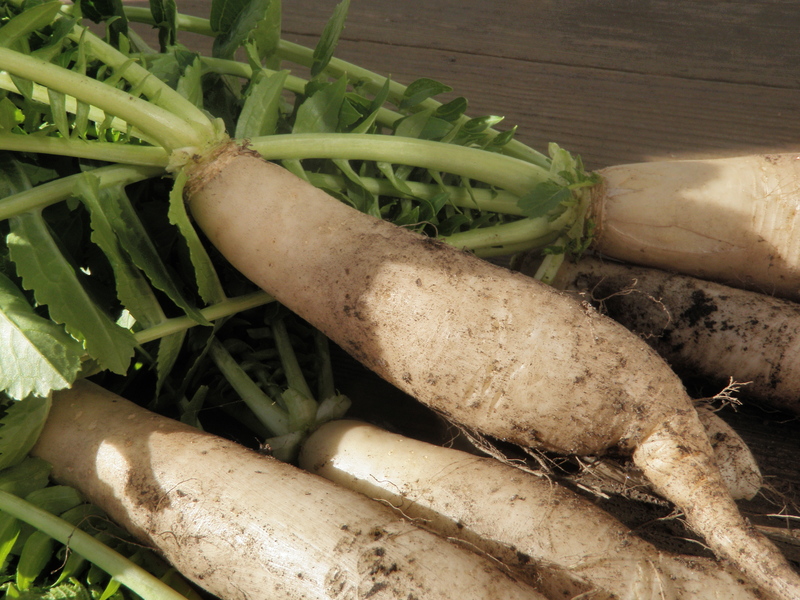 The little Daikon radish patch provided one last garden harvest for this year. I remembered a spectacular recipe from Shizuo Tsuji’s book, Japanese Cooking; A Simple Art. It is simple but each step is important. 1. Bevel the radishes. Cut thick slices and shave the rims to create a rounded shape from each slice. They will look something like little turnips with the tops and roots sliced off; flat on the top and bottom with smoothly rounded sides. 2. Simmer the radishes. Place them in a cooking pot with cold water to cover. Cut a piece of kitchen paper to fit right inside the pot and place it over the surface of the water to keep the radishes from floating to the top and drying out. Heat to boiling then lower the heat and simmer until the radishes are soft and translucent; 20 minutes or so, depending on size. 3. Drench the radishes. Drain the radishes of the simmering water and return them to the pot. Save the paper. Cover the radishes again with liquid, but this time use Dashi (Japanese broth) or something else with good light flavor. We used liquid reserved from cooking the wheat berries; seasoned with soy sauce and grated ginger. Cover the radishes again with the kitchen paper and return to simmering for another 20-30 minutes in order to drench them with the flavor of the broth. The theme was Breakfast for Dinner. Laura cut them and we ate them raw. You know the texture of a young carrot. Orange inside and red outside, 6 or 8 inches long. We served the carrots from a handmade Black Walnut wood plate that is smooth and light in weight. This idea is based on Ed Brown’s directions in Tassajara Cooking. Didn’t adding ketchup turn them into Dinner Carrots? Most important is eating cooked carrots in the morning. Clean the carrots and chop them into medium sized pieces with the skin on. Heat the oil in a large, heavy pot or frying pan and add the carrots, sprinkling them with salt. Cook the carrots over medium to high heat, stirring often enough to prevent burning, until they begin to caramelize. When the carrots are as brown as you wish, add the raisins and a splash of water and continue cooking until the raisins are plump and the carrots soft. It is obviously not sausage. Everyone seems to love tempeh. Crumble the tempeh into course chunks. Heat the oil in a heavy pan and add the crumbled tempeh. Cook over medium high, stirring enough until the tempeh is browning. Add the ginger and soy sauce along with a few tablespoons of water to the browned tempeh. 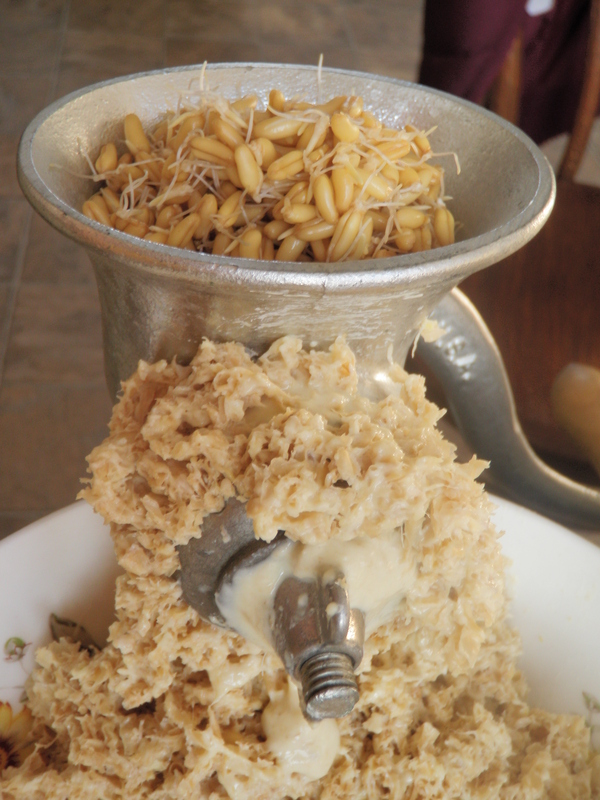 The water will help gather up the browned tempeh that might be stuck to the bottom of the pot. Add enough water to make all of the tempeh moist. Season to taste with soy sauce. I haven’t tried forming it into patties. Aveline Kushi’s Buckwheat Pancakes recipe adapted as waffles. Until amazake becomes more available commercially, or until we learn to make our own, we will have to use the EdenBlend amazake and soymilk drink from the aseptic packages. This double batch made one waffle each for ten of us. Combine all of the ingredients, adding more EdenBlend or water to thin to the desired consistency. Try not to stir any more than you have to. Cook it in the waffle iron or in an oiled frying pan. To keep the waffles from getting soggy while you cook the rest, stack them on a rack instead of on a plate. Serve the waffles with button mushrooms chopped and sauteed, and sprouts or, even better; mushrooms, arugula and sour cream if you wish. Dry roast the buckwheat in a heavy pan until it is dark brown but not burned. Add the water and salt and bring to boiling. Lower the heat and simmer for 20-30 minutes until the buckwheat is soft like porridge. Add more water if it gets too thick. Serve small portions in bowls, garnished with sliced scallions. Jess and Laura work on the farm and brought some squash to cook! Heat the oven at 350 degrees or higher. Peel the squash and cut them into chips. Clean the seeds. Oil the squash and spread them out on a baking sheet. Oil the seeds and put them off to one side of the baking sheet. Sprinkle all with salt. Roast the squash and seeds in the preheated oven until the squash is soft and the seeds are crisp. Add raisins, if you like, or sliced baby onions to the roasted squash and put it under the broiler at the end to brown a little bit. If you are going to replace your Thanksgiving turkey with Stuffed Hubbard Squash, then what about the pie? Happily you do not have to choose between the two. The concept of Balance is central to the macrobiotic diet and philosophy, but macrobiotic cooks and eaters are excessively obsessed with the bright orange, Round vegetable called a Buttercup (or Kabocha). Whatever. A squash addiction thinly veiled behind the macrobiotic principles of seasonality and local eating is simply more dignified than squash gluttony. Don't be fooled by the appearance; you will definitely wish there was more filling if you make these miniature pies. It is a respectable crust made with whole wheat flour (whole wheat pastry flour recommended but all I had was whole wheat flour). The crust is not sweet. I baked the scraps sprinkled with salt and they made fine crackers for lunch. Combine the flour and salt, and mix in the oil until it is the texture of sand. Add the cold water, using as much as is necessary to form dough. Mix minimally once the water is added to keep the gluten from forming. If you use the pastry flour this is less of a worry. Either way, it is difficult or impossible to make a flaky crust with oil. I chilled the dough for a half hour or so before rolling it out, and used an empty jar instead of a rolling pin. Sprinkle the cutting board or counter with flour, press out half of the dough at once and roll it about 1/8″ thin. Place it in your pie plate and finish the edges decoratively. Prick the bottom of the crust with a fork to keep it from puffing up. Bake ten minutes, empty, in a pre-heated 350 degree oven before filling it up. Crusts are most definitely not my strong point or my specialty. I don’t recommend making miniature pies in the muffin tin with this because there is way too much crust-to-filling. The filling is the good part here. You might enjoy making the entire batch (or a half batch) of this crust into crackers and eating the filling cold with a spoon. Peel the squash, remove the seeds and cut it into chunks. It doesn't matter how course you chop the squash. The smaller the pieces, the faster they will cook. 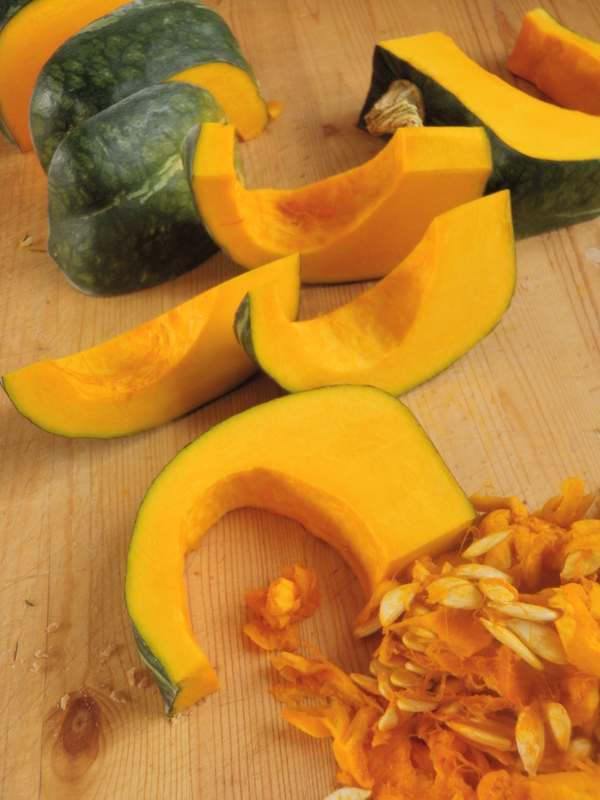 The amount of squash does not have to be exact; you might just wind up with extra filling if you use too much. Make sure you have enough. Place the squash chunks in a pot with the water and pinch of salt. Bring to boiling then lower heat and simmer until tender enough to puree; maybe half an hour. Use a spoon followed by a whisk to smash up the squash and whip it to a smooth puree. Add the barley malt and continue simmering for 5 minutes. Add the dissolved kuzu and simmer another few minutes until the mixture is thick and smooth. Let it cool slightly before filling the crust. Top the pie with walnuts and bake until the crust is browned around the edges and the walnuts are toasted. Be careful they don’t burn. As with pumpkin pie, this is better cold, so make it ahead. Alternatively, chill the filling and eat it like pudding. Damn. You could probably use maple syrup if your teeth are particularly sweet that day, although the barley syrup does just right for the flavor of the squash.